Introduction: Elderly patients are at risk of drug-related problems. This study aimed to determine whether a pharmacist-led medication review programme could reduce inappropriate medications and hospital readmissions among geriatric in-patients in Hong Kong. Methods: This prospective controlled study was conducted in a geriatric unit of a regional hospital in Hong Kong. The study period was from December 2013 to September 2014. Two hundred and twelve patients were allocated to receive either routine care (104) or pharmacist intervention (108) that included medication reconciliation, medication review, and medication counselling. Medication appropriateness was assessed by a pharmacist using the Medication Appropriateness Index. Recommendations made by the pharmacist were communicated to physicians. Results: At hospital admission, 51.9% of intervention and 58.7% of control patients had at least one inappropriate medication (P=0.319). Unintended discrepancy applied in 19.4% of intervention patients of which 90.7% were due to omissions. Following pharmacist recommendations, 60 of 93 medication reviews and 32 of 41 medication reconciliations (68.7%) were accepted by physicians and implemented. After the program and at discharge, the proportion of subjects with inappropriate medications in the intervention group was significantly lower than that in the control group (28.0% vs 56.4%; P<0.001). The unplanned hospital readmission rate 1 month after discharge was significantly lower in the intervention group than that in the control group (13.2% vs 29.1%; P=0.005). Overall, 98.0% of intervention subjects were satisfied with the programme. There were no differences in the length of hospital stay, number of emergency department visits, or mortality rate between the intervention and control groups. Conclusions: A pharmacist-led medication review programme that was supported by geriatricians significantly reduced the number of inappropriate medications and unplanned hospital readmissions among geriatric in-patients. This is the first prospective controlled study of the effect of a pharmacist-led medication review programme on medication use and health services utilisation among hospitalised Chinese elderly patients in Hong Kong. The medication review programme led by a clinical pharmacist resulted in a substantial reduction in the use of inappropriate medications among hospitalised elderly patients and all-cause unscheduled readmissions at 1 month after hospital discharge. A pharmacist-led medication review programme is an important strategy that can enhance the safety and quality of prescription among elderly patients in hospital. It is strongly recommended that these programmes be standardised and implemented in all medical and geriatric wards in Hong Kong. There is not much information about the effectiveness of a medical review programme among hospitalised elderly patients in Hong Kong. Two recent local reports that examined the effects of a clinical pharmacist–led medication review on hospital readmissions showed conflicting results and did not specifically address elderly patients.11 12 We therefore conducted a prospective controlled study to investigate the effectiveness of a comprehensive pharmacist intervention on medication use and hospital readmission among a group of geriatric in-patients in Hong Kong. This prospective controlled study was conducted in the geriatric unit of a regional hospital in Hong Kong. The unit has 38 in-patient beds and admits older people aged 65 years or above who are transferred from an acute hospital after initial stabilisation of medical and/or geriatric problems. The unit admits more than 1000 patients per year and provides medical treatment, rehabilitation, and discharge planning services by a multidisciplinary team composed of a geriatrician, residents, nurses, physiotherapists, occupational therapists, and medical social workers. All patients admitted to the unit during December 2013 to September 2014 were included. Patients were excluded if they refused to participate, were terminally ill with a life expectancy of less than 3 months, or if they had already received pharmacist intervention in another hospital prior to this admission. Eligible subjects were assigned to an intervention or control group according to the admission day of the week. Those who were admitted on Monday through Thursday were assigned to the intervention group, and those admitted on Friday through Sunday to the control group. This arrangement was to ensure that pharmacist intervention could be initiated promptly within 48 hours of patient admission. Demographic data, functional status, co-morbidities, and number of drugs on admission were collected at admission. (1) Medication reconciliation on admission to identify unintended discrepancies between medications prescribed on admission and the usual medications prior to admission—sources to assist medication reconciliation included: electronic patient record; patient’s ward case notes; interview with patient and/or patient carer. The number and type of unidentified discrepancies were recorded. (2) Medication review to check for medication appropriateness on admission and also at discharge—medication appropriateness was assessed by the Medication Appropriateness Index (MAI).13 There are 10 criteria to assess for appropriateness, namely indication, effectiveness, dosage, correct direction, practical direction, drug-drug interaction, drug-disease interaction, duplication, duration, and expense. For a drug item coded as ‘inappropriate’, relative weights for each criterion would apply. A sum of MAI scores could then be calculated to give a score ranging from 0 to 18. The higher the score, the more inappropriate the drug. Recommendations from the pharmacist after the reconciliation and medication review in the intervention group were then communicated to the in-charge doctor via a written note in the medical records. Recommendations were reinforced verbally if deemed appropriate by the pharmacist. (3) Pharmacist counselling on admission and also at discharge was provided to improve patients’ drug knowledge to ensure proper use of drugs and compliance after discharge. A discharge counselling service was provided for all patients who returned home. The counselling included any changes to drug regimen; an explanation of each drug’s indication; any untoward effects that might occur and when to seek medical advice; and drug storage and administration instructions. To ensure patient understanding, written information such as patient information leaflets were given to patients and their carers to remind them of the correct drug regimen. If the patient was illiterate, a simple diagram was drawn on drug labels to demonstrate the time of day and number of tablets to be taken. If necessary, individualised pictorial schedules with drug images and administration instructions could be produced for patients and their carers. The assistance of a family member or external care services such as a community nurse was enlisted if the patient was found to have compliance issues. The control group received routine clinical services. Records of the control group were retrospectively reviewed by the pharmacist after patient discharge to check for medication appropriateness on admission and also at discharge. The primary outcome measure was the appropriateness of prescription as measured by the MAI. Secondary outcomes included the acceptance rate by physicians, number of subjects with unintended discrepancies, patient satisfaction with the programme (for those home-living only), and unplanned hospitalisations 1 and 3 months after discharge. A sample size of 98 patients per group was required to have 85% power to detect an effect size of 0.9 on the MAI. Our sample size was finally set at 210 patients to account for loss of participants due to dropout or death. This sample size was comparable with a study by Spinewine et al14 in which MAI was used as one of the tools to assess appropriateness of prescribing in an acute geriatric care unit and 203 patients were recruited. Our study included 212 patients and was expected to have adequate statistical power to detect differences between groups. Descriptive analyses were performed and included the number and types of unintended discrepancies, MAI score upon admission and at discharge, types of drug-related problems, number of interventions made by pharmacists, and number of recommendations accepted by doctors and implemented. Outcomes for the two groups before and after the programme were compared using the t test and Chi squared test. The Statistical Package for the Social Sciences (Windows version 17.0; SPSS Inc, Chicago [IL], United States) was used and a P value of <0.05 was regarded as statistically significant. 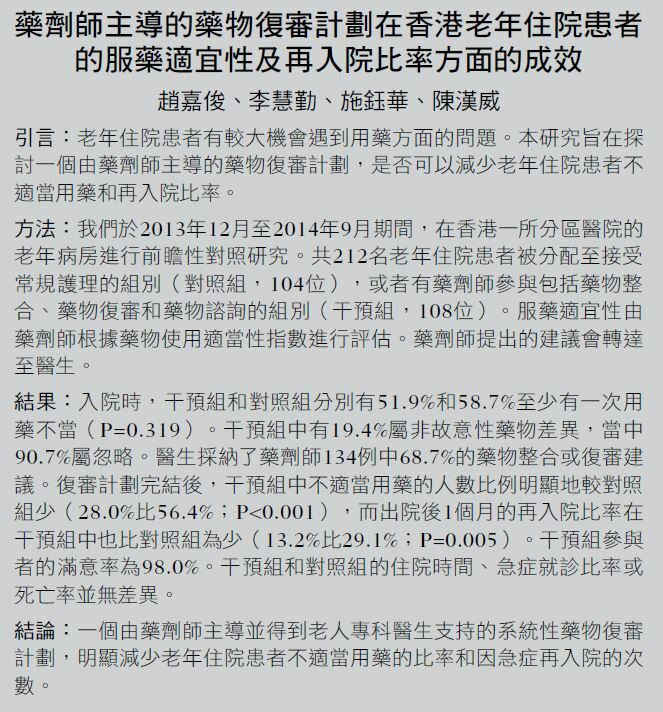 The study was approved by the Cluster Research Ethics Committee of the Hospital Authority Hong Kong West Cluster. Written consent was obtained from the patient or their caregiver. The absence of pharmacist intervention in the control group was considered acceptable because a pharmacy service was not a part of routine care at the institution. 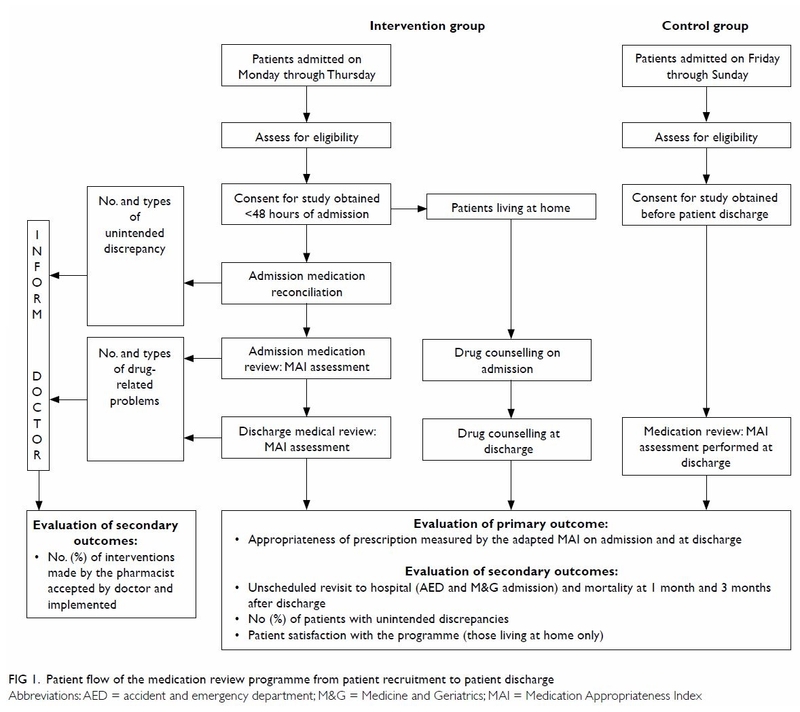 Figure 1 summarises the patient flow from recruitment to hospital discharge, the components of the medication review programme, and the planned outcome measures. A total of 212 patients were recruited. There were 108 subjects in the intervention group and 104 in the control group (Fig 2). There were no statistical differences in the baseline characteristics of patients (Table 1). On admission, 51.9% (56/108) of the intervention group and 58.7% (61/104) of the control group had at least one drug classified as inappropriate (P=0.319). Overall, 1996 drug items were reviewed by a pharmacist on admission of which 1020 were from the intervention group and 976 from the control group. Among them, 9.3% and 11.1% of the drugs, respectively, were classified as inappropriate (P=0.282). In the intervention group, 93 recommendations were made by the pharmacist of which 60 (64.5%) were accepted by the physicians and implemented. The mean (standard deviation) MAI score per patient was 2.19 (3.03) in the intervention group and 2.28 (3.09) in the control group (P=0.841). The mean MAI score per drug was 0.23 (0.30) in the intervention group and 0.25 (0.31) in the control group (P=0.628) [Table 2]. After the program and at discharge, the proportion of subjects with inappropriate medications in the intervention group was significantly lower than that in the control group (28.0% vs 56.4%; P<0.001). Among the 1999 drug items reviewed by the pharmacist on patient discharge, 3.5% (37 of 1048) of the intervention group and 9.7% (92 of 951) of the control group were classified as inappropriate (P<0.001). The intervention group also had a significantly lower MAI score per patient (0.95 (2.02) vs 2.02 (2.53); P<0.001) and MAI score per drug (0.09 (0.17) vs 0.24 (0.30); P<0.001) implying a significant reduction in medication inappropriateness after the pharmacist medication review (Table 2). Types of inappropriateness according to the MAI in the two groups are illustrated in Figure 3. In both the intervention and control groups, the common causes were indication, effectiveness, dosage, practical direction, duration, and expense. After the programme, there was a significant reduction in the number of these drug-related problems in the intervention group. Among the 108 subjects in the intervention group, 19.4% had at least one unintended discrepancy in medications, involving a total of 43 drug factors. The majority (90.7%) of these factors were omission of drugs, and 4.6% were due to inappropriate dosages. Of all the drug factors involved, 69.8% involved prescribed drugs from hospitals, 25.6% were from a private clinic, and 4.6% were over-the-counter drugs. Overall, 41 recommendations were made, of which 32 (78.0%) were accepted by physicians and implemented. Contact was made with 50 of the 90 non-institutionalised subjects 1 month after discharge to assess satisfaction with the programme. Of those contacted, 98.0% were satisfied with the programme and only one (2.0%) patient expressed a neutral opinion. There were no statistical differences in the length of hospital stay, in-patient mortality, or mortality at 1 month or 3 months after discharge. There was also no statistical difference in the number of attendances at the accident and emergency department 1 month or 3 months after discharge or in the unplanned hospital readmission rate at 3 months after discharge. The unplanned hospital readmission rate 1 month after discharge, however, was significantly lower in the intervention group than that in the control group (13.2% vs 29.1%; P=0.005) [Table 3]. To the best of our knowledge, this is the first local prospective controlled study to investigate the effectiveness of a pharmacist-led medication review programme on medication appropriateness and clinical outcomes among geriatric in-patients in Hong Kong. This study has demonstrated superior outcomes that favour a pharmacist-led intervention. There was a substantial reduction in the use of inappropriate medications and all-cause unscheduled readmissions 1 month after hospital discharge. Nonetheless, analysis of length of hospital stay, number of all-cause emergency department visits, and mortality rate favoured neither the intervention nor the usual pharmacist care. This study showed that one in five geriatric in-patients had an unintended medication discrepancy on admission. This figure was slightly higher than that found in a group of 3317 hospitalised medical patients (13%) over 1 year in an acute hospital in Hong Kong by Kwok et al.15 Subjects in our study were all elderly patients, whereas those in Kwok et al’s study were adults of all ages. Elderly subjects tend to have polypharmacy and thus are more vulnerable to unintended medication discrepancy when they move in and out of hospital or are transferred to another health care unit for further care. Unjustifiable medication discrepancies account for more than half of the medication errors that occur during transition of care and up to one third have the potential to cause harm.16 17 This does not bode well for our elderly patients with multiple co-morbidities. Up to 30% of the discrepancies in our study involved medications that had been prescribed by private practitioners or purchased over-the-counter. Unlike medications prescribed from the Hospital Authority, these medications might be overlooked unless the admitting doctor specifically asks for a detailed drug history from the patient. Knowing the medication history and hence resuming these medications are important if new health problems are to be prevented. Pharmacist-led medication reconciliation is therefore a critical process that can enhance patient medication safety by compiling a complete and accurate medication list for patients in hospital. This study revealed that more than half of the subjects (55.2%) received inappropriate medications. The majority of reasons for inappropriateness related to effectiveness, dosage, practical directions, and expense as reflected by the MAI. The inappropriate dosage and the questionable effectiveness might lead to not only failed pharmacological effects, but also potentially an untoward adverse drug reaction, especially in elderly individuals with pre-existing organ dysfunction.18 When a medication is not used according to the practical directions, it may lead to patient non-compliance. Optimising outcomes while reducing costs are the keys for medication management in today’s health care environment.19 Often there are several choices of drugs available to treat a disease or health condition and some are more expensive than others. The involvement of a ward-based pharmacist to review medication can enhance the use of appropriate medications in hospitalised patients and potentially reduce medication costs. Pharmacy departments within the public hospital system in Hong Kong have strived to implement the aforementioned patient safety strategies in different specialties. Nonetheless, this is not a standard practice simply because of insufficient pharmacist staffing resources. In some hospitals, a pharmacist service is provided in wards, but this does not apply in all cases and is not standardised. Experience of a pharmacist-led medication reconciliation service from an acute teaching hospital in Hong Kong showed promising results over a 1-year trial run with high acceptance and recognition by other health care professionals.16 It is hoped that the clinical role of clinical pharmacists in patient medication management in hospitals can be encouraged. Another local study has demonstrated a positive impact on medication safety in patients with diabetes by pharmacists’ intervention in collaboration with a multidisciplinary team.20 The feasibility of incorporating a pharmacist as part of a multidisciplinary team of health care professionals must be explored in geriatric wards in Hong Kong. With increasing life expectancy, the expanding elderly population will equate to an increase in morbidity and mortality owing to drug-related problems where the need for trained health care professionals to perform medication reviews will be in even greater demand. To enhance safe drug use with limited resources, a systematic approach must be adopted to cover all aspects that affect drug therapy. In terms of the impact on health care services utilisation, a recent systematic review and meta-analysis of the effectiveness of a pharmacist-led medication reconciliation programme revealed a substantial reduction in the rate of all-cause readmissions (19%), all-cause emergency department visits (28%), and adverse drug event–related hospital visits (67%).21 Our study revealed a significant reduction in unplanned hospital admissions (all-cause admission) at 1 month but not at 3 months. This implication might be due to an inadequate sample size to show the difference at 3 months. Alternatively, it might also imply that pharmacist intervention needs to be continued after patient discharge in order to have a sustained effect. This is supported by a study by Schnipper et al22 in which pharmacist intervention after patient discharge was associated with a lower rate of preventable adverse drug events 30 days after hospital discharge. During the pharmacist review, cost-effectiveness of drug use was assessed through MAI. Alternative options such as less-expensive formulations or drugs but of the same quality would be recommended to the doctor in-charge. This was a means of encouraging cost-effective use of drugs in a hospital. Furthermore, the reduction in unscheduled hospital readmissions in the intervention group implies a potential saving in hospital costs. Although a detailed analysis was not performed in this study, a rough estimation is that nearly HK$2 million may be saved annually as a result of lower drug costs and reduced hospital admissions, even after considering the cost of employing a pharmacist. The estimation was based on the following calculations. The estimated drug saving as a result of a switch to a more cost-effective alternative was HK$7500 among the 108 patients in the intervention group. This can be projected to a saving of about HK$69 500 in a unit that admits 1000 patients annually. In the current study, there were 16 fewer readmissions in the intervention group compared with the control group. Assuming a daily cost of an acute hospital bed is HK$4680 and the mean length of hospital stay is 3 days, this equates to a potential saving of about HK$2 080 000 per year in a unit that admits 1000 patients annually. If it is assumed that a pharmacist spends 30 minutes for each patient at an hourly salary of HK$433, the projected cost of an additional pharmacist to run the intervention would be HK$216 500 per year. The net annual saving of this programme to serve 1000 patients in this unit would thus still be close to HK$2 million. This study had several limitations. First, a substantial proportion (35%) of all the admitted patients were not screened by a pharmacist on admission. This was due to a temporary pause in subject recruitment when patients were admitted on public holidays, when the pharmacist was on holiday or when she had to relieve another pharmacist in the hospital. Moreover, a substantial proportion (44%) of eligible subjects were not included owing to no consent or refusal. These factors might have resulted in selection or self-selection bias. Second, subject recruitment was not randomised, but done according to the day of admission. This might be a source of bias. Nevertheless, this would have minimal influence on the outcomes, as the baseline characteristics of the intervention and control groups were comparable. Third, the pharmacist who carried out the review and data extraction was not blinded to the study hypothesis and the group status of the subjects. This could potentially lead to information bias, although this might be partially offset by the fact that the majority of the information or data on the outcome measures were taken with reference to a well-established and validated tool. Fourth, this study was performed in a single unit, so generalisation to other settings is not possible. Fifth, MAI is an implicit tool that is subjective. A single pharmacist as the rater might limit the reliability of the assessment results. Nevertheless, the more explicit tools of STOPP/START criteria23 had also been referred to in addition to the MAI during the review process. Sixth, this study only addressed appropriateness of drug use, whereas underuse of drugs was not investigated. Finally, this study could not conclude a causal relationship between the reduction in inappropriate medications and the reduction in unscheduled hospital readmissions because there were several components in the intervention that included a medication review, medication reconciliation, and discharge counselling. It is difficult to be certain which of these components alone or in combination gave rise to the positive outcome of this study. On the other hand, there were several strengths in this study. 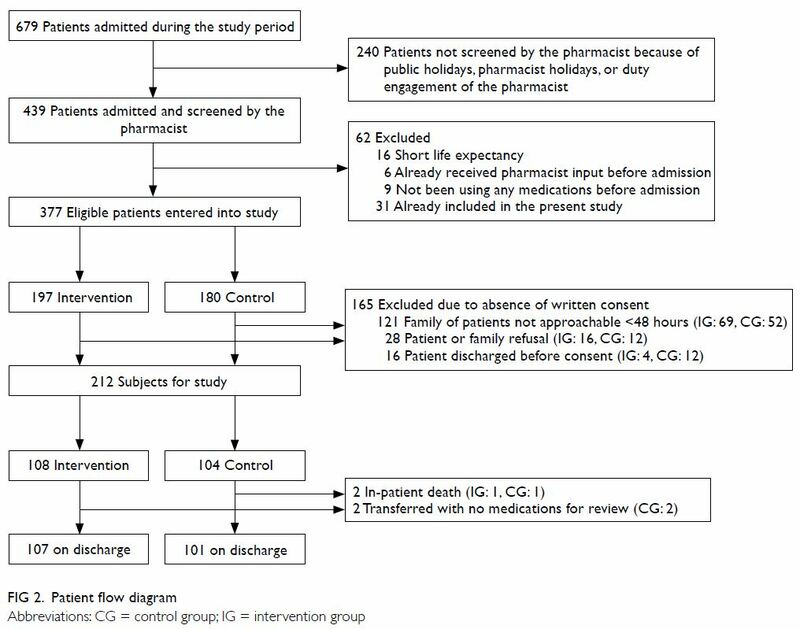 This was the first prospective controlled study of the effect of a pharmacist-led medication review programme on medication use and health services utilisation involving over 200 Chinese elderly patients in Hong Kong. Second, a well-validated tool was used to assess medication appropriateness. The use of the MAI tool focused on the patient and the entire medication regimen. Third, there was a comprehensive review of outcomes including quality of prescribing, health services utilisation, mortality, length of hospital stay, and patient satisfaction. This study supported the role of a hospital-based clinical pharmacist to enhance appropriate medication use among elderly Chinese in-patients. A systematic medication review programme in a geriatric unit resulted in a reduced number of drug omissions and fewer inappropriate medications. The service provided by the clinical pharmacist and supported by geriatricians was welcomed by patients and their carers. Together with the potential to reduce hospital readmissions and their associated cost, it is hoped that an in-hospital pharmacist-led medication review programme can be recognised as one of the important strategies to enhance the safety and quality of prescription among elderly patients in hospitals. It is strongly recommended that these programmes be standardised and implemented in all medical and geriatric wards in Hong Kong. Future studies should recruit a larger sample size in a randomised controlled design in other geriatric hospital settings to reiterate our findings. Furthermore, these studies might consider including adverse drug event–related hospital visits as one of the outcome measures. 8. The ACHS EQuIP5 (5th edition of the ACHS Evaluation and Quality Improvement Program) clinical standard 1.5, criterion 1.5.1.: Medication are managed to ensure safe and effective consumer/patient outcomes. Sydney: The Australian Council on Health Care Standards; 2010. 9. Medication reconciliation. Patient Safety Network. Agency for Healthcare Research and Quality. US Department of Health & Human Services. Available from: http://psnet.ahrq.gov/primer.aspx?primerID=1. Accessed 11 Jun 2017. 10. Gurwitz J, Monane M, Monane S, Avorn J. Polypharmacy. In: Morris JN, Lipsitz LA, Murphy K, Bellville-Taylor P, editors. Quality care in the nursing home. St. Louis, MO: Mosby-Year Book; 1997: 13-25. 11. Wong CY, Lee TO, Lam MP. Pharmacist discharge intervention programme to reduce unplanned hospital use in patients with polypharmacy. Hong Kong Pharm J 2017;24(Suppl 1):S18. 12. Chan HH. To reduce avoidable readmission of patients who are categorized as high risk by 30-day hospital readmission model at medical ward of United Christian Hospital through medication reconciliation and discharge counseling. Hong Kong Pharm J 2017;24(Suppl 1):S21. 15. Kwok CC, Mak WM, Chui CM. Implementational experience of medical reconciliation in Queen Mary Hospital. Hong Kong Pharm J 2009;16:50-2. 18. Cameron KA. Caregivers’ guide to medications and aging. National Center on Caregiving, Family Caregiver Alliance 2004. Available from: https://www.caregiver.org/caregiver%CA%BCs-guide-medications-and-aging. Accessed 11 Jun 2017. 19. Splawski J, Minger H. Value of the pharmacist in the medication reconciliation process. P T 2016;41:176-8.